Description of decorations: In this aquarium I used various techniques for its design, the first was to orient the waterscape diagonally obtaining A front view of 120 cm, and A left side view with A depth of 95 cm that allowed me to shoot video with GoPro. I built A descent of 30 cm in height along the left side view. For this incline, i used lava rocks, gravel, fine sand and clay. In the lower points of the aquarium, I created the pockets for debris as in nature. Debris is made from an old undergrowth aged for a month in a bucket with still water, stimulating the progression of anaerobic bacteria and natural organic decomposition of small pieces of leaves, grass, twigs and seeds, changing shape and color, which became darker and darker. I have to admit that last week I could not do it because of the stink that was in all fishroom. I realized that I have to stop decomposition process; first I started frequent changes of water and I inserted pipe with ozone generator, which disinfected all debris. After five days of ozone, I added debris into the pockets in the aquarium. Additional structures ware added as old roots aged also in water to add depth. 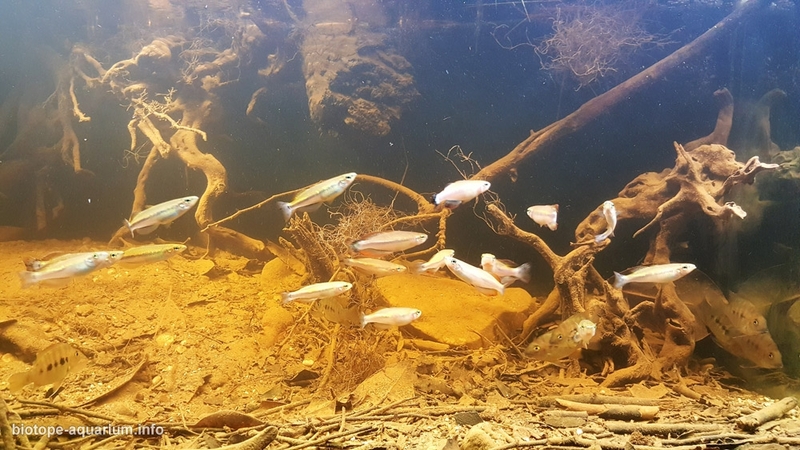 Description of equipment: Filtration of water is entrusted to Phytofilter installed above aquarium and masked as river edge. To move water to the surface use JBL CristalProfi e1901, in the aquariums do not use heaters because it warms up in the fishroom. Water parameters: Temperature is 26°C – 78,8°F, pH is 6.8 – 7.2, GH is 14, KH is 7. Description of the area surrounding the biotope: Mahambo is a town and commune (Malagasy: kaominina) 17°29’12.81S 49°27’20.41E in Madagascar. It belongs to the district of Fenerive Est, which is a part of Analanjirofo Region. The population of the commune was estimated to be approximately 26,000 in 2001 commune census. Primary and junior level secondary education are available in town. The majority 80% of the population of the commune are farmers. The most important crops are rice and bananas, while other important agricultural products are cloves and lychee. Services provide employment for 17% of the population. Additionally fishing employs 3% of the population. A few miles southward is the famous Pangalanes Channel which is a chain of freshwater lakes and lagoons parallel to the Indian Ocean coast, separated by a narrow strip of land. The lakes are connected by a system of artificial channels that forms an internal waterway from Tamatave to Farafangana, making it the longest canal in the world covering a distance of 600 km. The canal was built between 1896 and 1904 under the government of General Joseph Gallieni during the early French colonial years. It was designed to facilitate the transport of goods to the main commercial port of Tamatave, because shipments to the Indian Ocean were too dangerous. I do not want to bore you with boring descriptions, but in my opinion this channel was the ruin of aquatic fauna in Madagascar. Fish species that I am presenting, tolerate water with little salt, over the years they had to adapt by force to the increase in salinity. This factor allowed Ptychochromis Grandidieri to populate the whole Channel along the coast with all its rivers. Description of the underwater landscape of the biotope: Despite the months of my research, I did not find much information on the environment apart from the two lines on the internet “Water clear but very heavily tannin stained.” Substrate with large pockets of organic debris. here I can not be sure of the exact description. I went to the extreme and I identified swamp with Google Earth and I discovered that there are trees on the shore, by examining and studying how swamps are structured I decided to reproduce this biotope anyway. 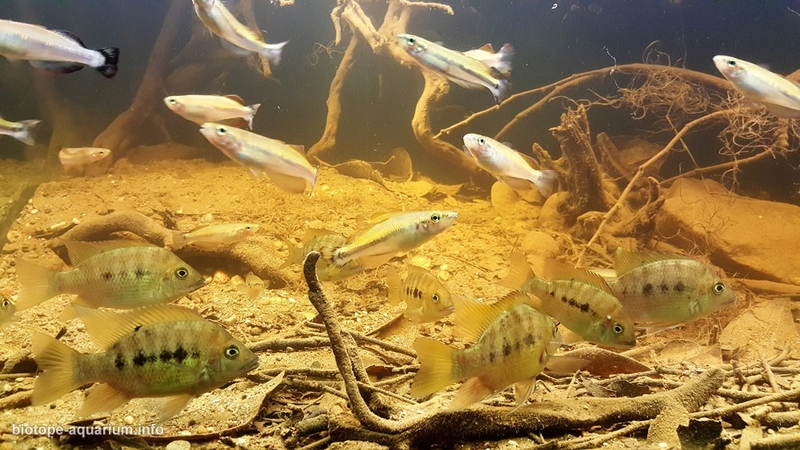 There are two colour forms of Bedotia Longianalis; a primarily yellow form which occasionally shows hints of a blue wash in the fins and a deeper orange form whose black colouration seems deeper than that found in the yellow population. The author’s notes on the distribution of these colour populations is incomplete. Anecdotal information indicates that the orange populations typically occur in marshy, more tannin stained waters. Due to this species ability to tolerate brackish water and its wide range it is not considered to be endangered. Typical Habitat Ptychochromis Grandidieri: Commonly found at lower elevations along the eastern coast. Found in both Lacustrine and riverine habitats, although the latter is more common. Typical Habitat Bedotia Longianalis: Areas typically have no forest cover nor any riparian vegetation. Water clear but very heavily tannin stained. Substrate sand with large pockets of organic debris. Emergent sedges but no truly aqutic vascular plants. Description of the parameters of the habitat: Ph: 4.5 – 7.5, Temperature: 74 – 84.0 °F, Data are incomplete and unverified. 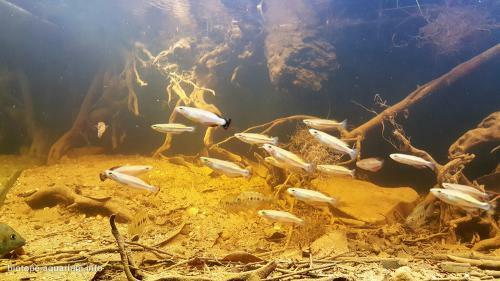 List of fishes and invertebrates occurring in the nature biotope: Bedotia Longianalis Swamp, Ptychochromis Grandidieri, Kuhlia rupestris, Ophiocara macrolepidota, Macrobrachium sp., Ambassis sp., Eleotris pellegrini, Typhonodorum sp., Invasive species (Channidae sp.). 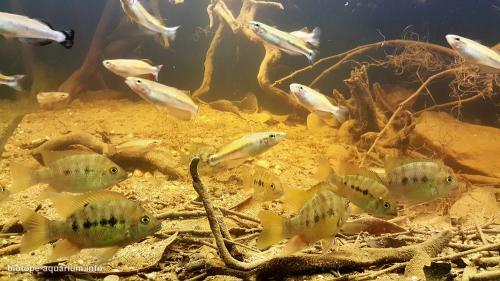 Threats to the ecology: For centuries, that territory has been threatened first by way of Canal Pangales which united all rivers, streams and lakes along the coast, mixing the aquatic fauna in a single water system that has provided crossings between species and overhang of the flora. Then there is another factor, agriculture, we know that 80% of the population Arechavaleta rice farmers, and in fact all the region and expanse of rice camps. I have well looked at the area with Google Earth observing rice fields and tracing water paths, all rivers and streams are joined together with these channels that water fields, reuniting one with another. I could talk about deforestation in progress, but trees are almost no threat. The introduction of Channidae spp. it could be a future threat. The use of the mosquito net as A seine is now common in Madagascar and this practice can have a major impact on fish in the endemic population. All two species are in great demand on the tables of the Malagasy people and often fished to feed.